DH loves, loves, LOVES Pizza Hut pan pizza, but, their heavy, greasy pizza doesn’t exactly agree with me. So when I was this on your home based mom, I was anxious to try it. Making it at home, I had a little more control over the “grease factor” that keeps us away from the place. Now, here’s the dilemma: *I* thought it tasted nearly exactly like pizza hut…but less greasy. The sauce tastes DEAD ON to me, and the oil in the pizza pan really makes the dough taste “correct”. DH, however, claims he doesn’t think it tastes like Pizza Hut at all, but acknowledges it’s been so long since he’s had it, he could be wrong. This recipe also had a lot of “Advice” with it from Real Mom Kitchen, were LeighAnne apparently saw the recipe. I’m going to just copy that advice here, so you can take it into consideration when you make your pizzas. I did use her advice to only use enough oil to coat the bottom, to use glass (I thought I had 3-9″ cake pans and I did not….so I used her suggestion of 1-9″ pie plate and a 9×13 pan), and to pull the cooking temp down to 450. Next time I’ll bump that back up to 475, though, because I think it’ll do a nicer job on the pizza at a higher temp. Makes 3-9″ pizzas, or one 9″ pizza-in-a-pie-plate and a 9×13 rectangular one! – Put the yeast, sugar, and dry milk in a large bowl, and add the water; stirring to mix well. Let sit for 2 minutes. Add oil and stir again. – Add flour and stir until dough forms and flour is absorbed. Turn out onto a flat surface and knead for about 10 minutes. – I won’t lie — I used my kitchen aid for the entire first two steps. I mixed the dough into a ball with my mixer paddle, and then switched to the dough hook and let it knead the dough. – Using a rolling pin, roll out each dough ball to about a 9″ circle and place in the cake pans. Spray the outer edge of the dough with cooking spray, and cover with a plate. Place in a warm area and allow to rise for 1-1 1/2 hours. *I doubled the sauce recipe below — I was afraid it wouldn’t be enough. Plus, it gave us extra for dipping! – Place toppings of your choice on in this order: pepperoni or ham, vegetables, meats (cooked ground sausage or beef). 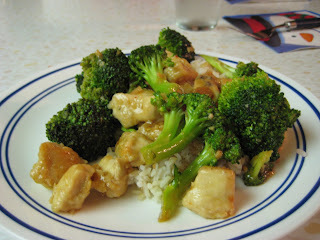 DH loves General Tsao’s (I’m positive I’m spelling that wrong…) so I thought we’d try this recipe at home. But — like every time I try Asian-anything at home — it just isn’t as good as getting it at a restaurant. DH liked this, but I could’ve passed on it. I’m not a big fan of ginger, and it’s a prevalent flavor in the dish, so that may be why. – Cook rice according to package instructions. – Meanwhile, in a large bowl, stir together 1 tablespoon cornstarch and ½ cup cold water until smooth. Add snow peas, garlic, ginger, sugar, soy sauce, and red-pepper flakes; toss to combine, and set aside. – In another bowl, whisk together egg whites, remaining 3 tablespoons cornstarch, ½ teaspoon salt, and ¼ teaspoon pepper. Add chicken, and toss to coat. – In a large nonstick skillet, heat 1 tablespoon oil over medium-high. Lift half the chicken from egg white mixture (shaking off excess), and add to skillet. Cook, turning occasionally, until golden, 6 to 8 minutes. Transfer to a plate; repeat with remaining oil and chicken, and set aside (reserve skillet). – Add snow-pea mixture to skillet. Cover; cook until snow peas are tender and sauce has thickened, 3 to 5 minutes. Return chicken to skillet (with any juices); toss to coat. This is the recipe I referenced yesterday (See Fran? You didn’t have to wait long!) — these are REALLY REALLY delicious (I daresay they may be better than store-bought oreos), but unfortunately we ate them all before I could get a picture. I’ll add pictures next time I make them (by then — in my new kitchen! Woohoo!). – In a food process or the bowl of an electric mixer, thoroughly mix the flour, cocoa, baking soda, baking powder, salt, and sugar. – Lightly press, to work the filling evenly to the outsides of the cookie. 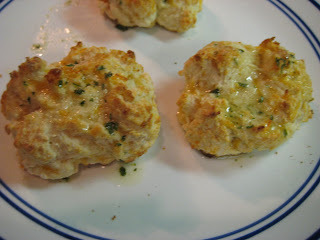 Red Lobster’s Garlic Cheddar Biscuits!! 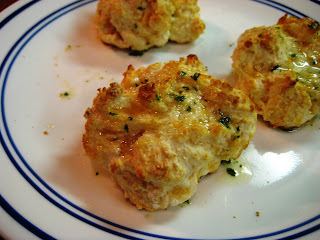 This is a copycat recipe — but it tastes EXACTLY like those little morsels of heaven from Red Lobster! A little more labor intensive — since you have to make them and pour the butter over them — but well worth it! – Heat oven to 450 degrees. – Mix Bisquick, milk, and cheese until a soft dough forms. – Drop by spoonfuls onto an ungrased cookie sheet. – Bake 8-10 minutes or until golden brown. – Melt butter or margarine, and add the garlic powder and parsley; stir. – Brush or spoon the melted butter mixture over the warm biscuits.